Dogs get stressed for all kinds of reasons, just like we humans. And although we hate to admit it, and we know how hard the animal-loving drivers who work alongside us try, one of the major causes of this stress is travel. Our canine companions can also pick up on our own stress, and so sometimes the whole process of arranging and taking a long journey can just heighten an already tense situation, or introduce some stress when there’s no need for any to be there in the first place. For plenty of people, living with stress is just the way things are. But dogs have evolved to live with humans as a means of removing much of the stress from their lives – we provide them with food, shelter and regular affirmation of our love for them. And of course, in return, they can give us just as much affection. But sometimes, things get in the way of a dog fully settling into a loving relationship with its owners, and one of those ‘things’ can be stress. Changes to their home surroundings. This could be something as basic as redecorating their familiar indoor spaces. OK, so it has to be done, but you can help them in a number of ways, such as minimizing their exposure to paints, adhesives and other products used, taking them for regular walks, and moving their feeding area to a place unaffected by any works. Of course, the ultimate example of the above scenario would be moving house. Dogs (and cats for that matter) crave familiarity, in their people and their surroundings. So upsetting this balance can bring about some serious disharmony. A dog may react in a number of ways to the arrival of a new person in its life, but of course, you’ll want to get things off on the right footing. So the best way to handle this is to take it slow, and have your dog used to obeying a few simple commands. That way, he’ll be in a compliant frame of mind. Dogs get frustrated when they don’t get enough exercise. Many of them are bred to work outdoors, so by bringing them into our homes, we’re taking them out of the surroundings where they’d feel most comfortable. Giving them regular access to an outdoor space, where they can be free to run around and let off steam is therefore a major benefit to their health. Like humans, dogs can develop rivalries with other pets, and it may take a little while to establish a natural ‘order’ when you introduce a new animal to the house. Again, result = stress. If a dog looks up at you like this, there’s a good chance that it’s anxious or wary of what’s going to happen next. How Will My Dog Show Stress? Put a dog in a situation which makes it feel threatened or uneasy, and it will revert to some of its most base instincts. Put simply, it will adopt a ‘fight or flight’ approach. You’ve probably seen the first of these in action, when your dog will literally launch itself at another animal, or even a person, it considers to be a threat. Other dogs will go to the other extreme, and simply run away from the situation, and go find somewhere to hide. And finally, some will just shut down, and try not to acknowledge the situation at all, instead just ignoring whatever is the cause of the problem – which could even be you. 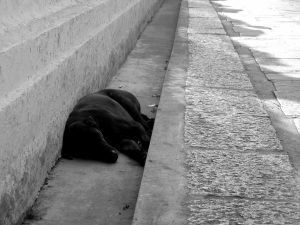 One thing’s for sure though – in such situations, dogs are more sensitive to the presence of other dogs, and that’s why they can often become hostile to an animal whom they would normally rub along perfectly well with. Stress also often manifests itself through a temporary loss of appetite, so if your dog not only rejects his favorite treat, but also shows a general decrease in interest towards any food, it could be a sign that something is bugging him. There’s even an app, the Dog Decoder, which you can use to help you interpret what any of these signs in your dog might mean. How Can I Relieve My Dog’s Stress? Keep to their regular schedule. This might be out of the question if they’re being transported over any long distance, but trying to plan any journey so that it fits around times when they would normally be sleeping or doing little activity is a good move. If they can’t take a walk, give them a toy to play with. Those familiar play balls and toys will bring some comfort to a dog while it’s undertaking a long trip. Let the dog have its own space. You might be tempted to pay them lots of attention, and give them reassurance, but this can make things worse. If you’re trying to acclimatize a dog to a crate for a long car journey, be sure not to invade its space while it’s exploring and getting used to its confines – however much you might want to encourage him. Stay calm and try not to show stress yourself. The dog will pick up on this, and only make it feel worse. So over-compensating and becoming ‘lovey-dovey’ won’t work, because they’ll know you’re trying too hard to comfort them. Be natural in your interactions. Try a natural remedy. Your veterinarian must be consulted first, but you can add a variety of natural supplements to your dog’s food with the aim of calming them, while a variety of pheromone diffusers are available. These give off a scent which is calming to a dog, but which is often undetectable by humans. Anti-anxiety medication. 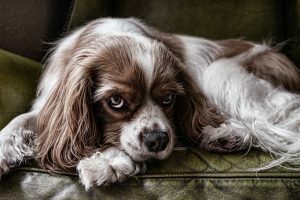 Consider this a last resort, but your veterinarian may be able to prescribe this, on the understanding that it’s only given when you dog shows definite signs of becoming over-agitated. A dog often wants nothing more than a cool spot to settle down in. So even when they’re being transported, Citizenshipper’s drivers will take great trouble to satisfy their need. Many of the carriers who take on work through Citizenshipper are dog-owners themselves. So they will always try to put a dog they’re carrying at ease. Favorite toys and their regular bedding are common ways of acclimatizing them to the surroundings of a strange vehicle, and some will play gentle, soothing music on-board to try to calm a nervous passenger. If you prefer an alternative approach, one of our drivers is even an holistic pet healer, who, on her clients’ consent, will use essential oils to create a calming atmosphere inside her vehicle to help keep their animals relaxed while traveling. And while that may be an unconventional approach, every driver who’s registered to carry animals with CitizenShipper does the job because they genuinely love the animals, and the people, they meet. And they’ll do everything they can to make your pet’s experience a happy and enjoyable one. Be sure to set a schedule carefully, and then stick to it – unforeseen incidents aside – and stay in touch with regular journey updates. A cool dog is usually a pretty unstressed, and so happy, dog. That goes for wherever they happen to be, or where they’re going. So when you book dog transportation through Citizenshipper, be sure to discuss with the driver you choose how they will keep your canine cool. They’ll be happy to give you the information you need, because they want to earn your trust and, if possible, your repeat business! Dogs will automatically seek out a shady spot when the heat rises – so if you’re transporting them, you need to be sure that they can find one. 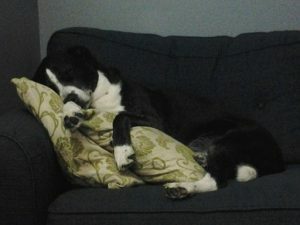 This entry was posted in Pets and tagged keeping dogs cool, pet transport, Pets. Bookmark the permalink.